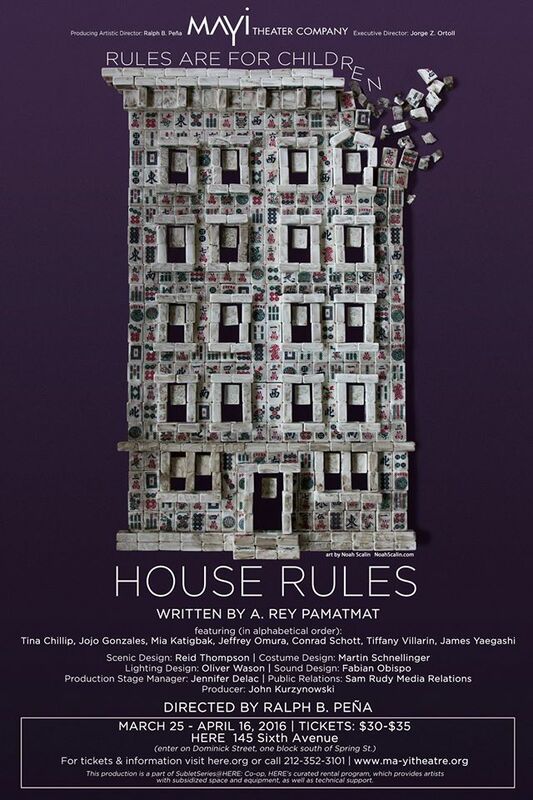 In HOUSE RULES, tradition and contemporary manners make strange bedfellows when the grown children of two Filipino-American families – neighbors in the same apartment building – come to realize their parents are not immortal, and that the rules of the many card and board games they play together are constantly renegotiated, as are the rules of living. In the mix are a tough-as-nails father, his sons, a physician and a comic book artist; a no-nonsense mother and her daughters, a doctor and a budding photographer; and another doctor who has mysteriously broken off his engagement with the old man’s son. Directed by Ma-Yi Theater Company’s Producing Artistic Director Ralph B. Peña, HOUSE RULES cast features Tina Chilip (Golden Child), Jojo Gonzalez (MA-YI’s The Romance of Magno Rubio), Mia Katigbak (NAATCO’s Awake and Sing! ), Jeffrey Omura (The Plant That Ate Dirty Socks), Conrad Schott (The Glory of the World, BAM), Tiffany Villarin (Peerless, Yale Repertory) and James Yaegashi (The Oldest Boy). This production is a part of SubletSeries@HERE: Co-op, HERE's curated rental program, which provides artists with subsidized space and equipment, as well as technical support. Scheduled through April 16th, HOUSE RULES will perform Tuesdays through Saturdays at 8:30; Saturday and Sundays matinees are at 4PM. There is no performance on Sunday, March 27th. Tickets are $30-$35. For tickets and information: visit here.org, or call 212-253-3101. Information is also available at www.ma-yitheatre.org. A. Rey Pamatmat’s (playwright) newest play HOUSE RULES will premiere at Ma-Yi Theater Company, and his play AFTER ALL THE TERRIBLE THINGS I DO will be produced in About Face’s 25th Anniversary Season, both in Spring 2016. Recently, his work was celebrated in Boston where the Huntington and Company One Theatres presented AFTER ALL and EDITH CAN SHOOT THINGS AND HIT THEM concurrently in the Calderwood Pavilion. EDITH premiered at the Humana Festival, received the Steinberg/ATCA New Play Citation, and was nominated for GLAAD Media and Lambda Literary Awards. Rey’s plays A POWER PLAY; OR, WHAT’S-ITS-NAME and THUNDER ABOVE, DEEPS BELOW were developed at the O’Neill Playwrights Conference, and his shorts appeared in New Black Fest’s FACING OUR TRUTH, THE MYSTERIES at The Flea, and two Humana Festival anthologies. Other productions: THUNDER ABOVE, DEEPS BELOW (Second Generation), A SPARE ME (Waterwell), DEVIENT (Vortex), HIGH/LIMBO/HIGH (HERE); publication: Samuel French, Playscripts, Cambria Press, Vintage; awards: ’12/’13 Hodder Fellowship, ’11/’12 PoNY Fellowship, Princess Grace Award and Special Projects Grant, NYFA Playwriting Fellowship, E.S.T./Sloan Grant. Rey is Co-Director of the Ma-Yi Writer’s Lab and teaches at Primary Stages ESPA and SUNY Purchase. BFA: NYU, MFA: Yale School of Drama. Ralph B. Peña (director) is the Producing Artistic Director of Ma-Yi Theater Company. Recent directing credits include THE ORPHAN OF ZHAO (Fordham Theatre), MACHO DANCER: A MUSICAL (Cultural Center of the Philippines), LIVIN’ LA VIDA IMELDA (Ma-Yi), Lloyd Suh’s THE WONG KIDS IN THE SECRET OF THE SPACE CHUPACABRA GO! (Children’s Theater Co., Ma-Yi, and Arts Emerson, Boston, winner of the Off Broadway Alliance Award), Joshua Conkel’s CURMUDGEONS IN LOVE (EST Marathon), Mike Lew’s MICROCRISIS (Youngblood, Ma-Yi), and HOUSE/BOY (Dublin and Singapore Theater Festivals). He received an Obie Award for his work on THE ROMANCE OF MAGNO RUBIO. Upcoming projects include the premiere of FELIX STARRO, a new musical by Jessica Hagedorn and Fabian Obispo. He is a member of the Ensemble Studio Theater. MA-YI THEATER COMPANY recently enjoyed great critical and popular success with its double-bill last fall of LIVIN' LA VIDA IMELDA and CHAIRS AND A LONG TABLE, and this past spring’s world premiere of SOLDIER X. The company won the Off-Broadway Alliance Award for its critically-acclaimed production of THE WONG KIDS IN THE SECRET OF THE SPACE CHUPACABRA GO! last season. Founded in 1989 and now celebrating its 27th season, MA-YI is a Drama Desk and OBIE Award-winning, Off-Broadway not-for-profit organization whose primary mission is to develop and produce new and innovative plays by Asian American writers. Ma-Yi Theater is under the leadership of Producing Artistic Director Ralph B. Peña and Executive Director Jorge Z. Ortoll.